I need to have my own tree house near a waterfall. Andy and I have been engaged for one year. As a treat to ourselves we decided to stay at Rabeang Pasak Tree House Resort and splash around in the Sticky Waterfall, about 45km from Chiang Mai. 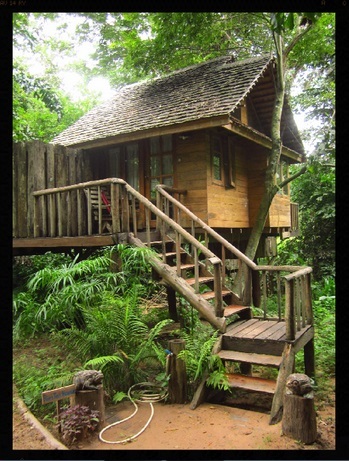 Have you ever stayed in a tree house? If the answer is no, do it. Best place to stay ever? I think so. We've been lucky enough to be able to stay in some pretty fancy hotels in Bangkok and on some islands (thanks mum). This beats it. 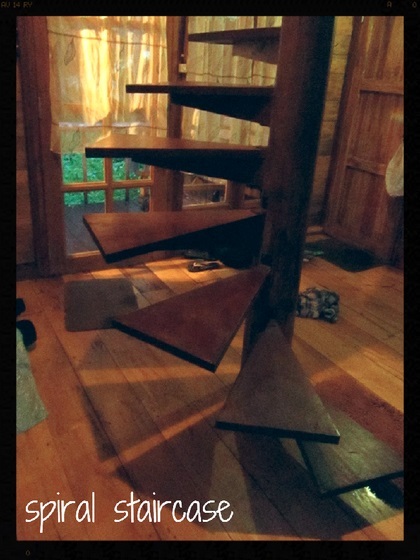 Our all-wood tree house was on the bank of a stream and had a spiral staircase up to a loft bed, lots of windows looking out into the jungle and nooks with books. The shower was outside under trees, sky and fireflies. There was a swing underneath the house. The balcony behind the house hung out over the stream. That tree house was 3865 times more homely than the house I live in. It was twenty minutes away from the second best waterfall we've been to in Thailand. We didn't want to leave. It was like a dream house, plucked from a book and made in real life. I've never truly had a dream house before, but an exact replica of the Riverview House, but bigger and with a kitchen and second bedroom, is my dream house. On Saturday we ate ice cream, drove to the Mae Ngat Dam (only do this if you have time to spend an afternoon at a houseboat on the water - the area around the carpark isn't very nice, but if you get a boat to a houseboat it is beautiful), drove to the resort and played in the water at the Sticky Waterfall. We spent Saturday evening eating Thai food, drinking wine, eating bread and cheese and watching Star Wars in our cozy little house. Today we met a great couple from Scotland called Jude and Don and took them to the waterfall before going on a drive through gorgeous Thai countryside (think jungle, lychee, banana and corn plantations, rice paddies, Lanna-style houses). Jude and Don told us that on Saturday Mink, the owner, took them to see some things nearby for free in a 40 year old jeep. They saw a ghost market (I won't tell you what that is, I think you should find out for yourself because it sounds really interesting to me) and a bat cave. Also, Don ate a fried tarantula at the resort. He mentioned that he would try a spider if there happened to be one, so the staff went off to find one, cooked it, and gave it to him. That's service ;) They said that it wasn't venomous and indeed there are no venomous spiders in Thailand, only snakes. Not sure if I believe it. Waterfalls are all over Thailand. If you've been to Thailand, you've been to a pretty amazing waterfall. We've seen a fair few and this is the second best (the winner so far is on Koh Kood island). 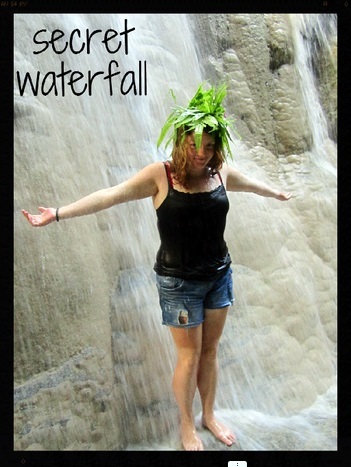 You can climb up and down Bua Tong waterfall because the rocks are sticky, not slippy! They are covered in grippy calcium carbonite from the water and feel like pumice and you won't/shouldn't slip over because your feet have excellent grip on this surface. Look at the picture below - don't you just want to go in!? There are several levels and you can start at the very bottom and climb all the way up. At the very bottom level there is a more waterfalley waterfall, hidden away... perfect when there's nobody around. You can also walk to the source, called Rainbow Spring. Magical to see the water pluming up from the ground. We've been three times recently and can tell you that the best time to go is late afternoon. The waterfall (supposedly) closes at 6pm. Be there from 4 and you'll have the place to yourself with afternoon sunlight shining through the leaves and reflecting in the water. You can buy snacks, but no meals or coffee. Entrance to the waterfall is free. From Chiang Mai, take route 1001 toward Phrao for about 45km. 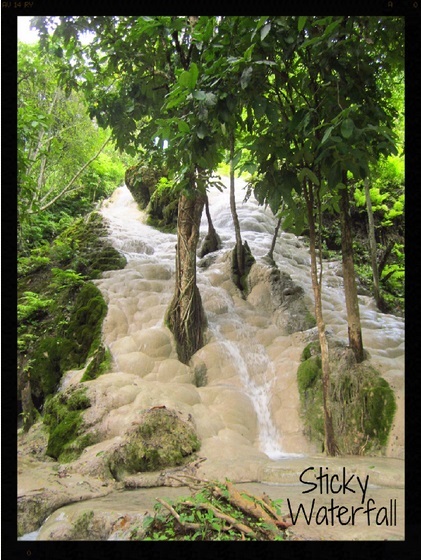 The Sticky Waterfall is on your right (there are signs - look out for Bua Tong Waterfall, Chet Si National Park). Most houses cost 1,500 baht per night. Bigger ones for families cost more. Each house is different. There is a fan but no air conditioning. You don't need it there, promise. There are several plug sockets in each house. You get water, umbrellas, towels, shower gel, shampoo and conditioner. Free WiFi is available at the dining area. You can borrow motorbikes and bicycles for free if nobody else gets there first, just pay for petrol. The resort is pretty big and has a small river flowing through it. House are dotted around the banks. Some are high up and some are low down. All the ones we looked at were so nice, but some are bigger than others and one has a bathtub in it. We stayed in Riverview House because it felt the most magical and cozy. Book your own tree house adventure here! Send Mink an email and he will arrange a pick up for you. 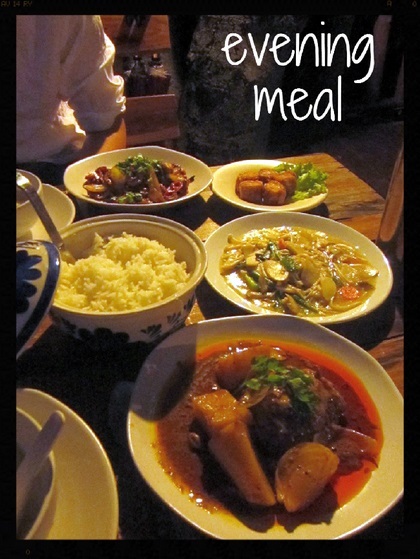 You have to tell Mink the owner which meals you want before you arrive because the nearest market is very far away. You should also let him know if you have any dietary requirements/taste preferences. So, what you get is a (super tasty) surprise tailored to your tastes. Breakfast: 150 baht. 8am - 10am. We were both given toast with butter and jam and fruit. I had hotdog sausage, ham and a fried egg. My vegetarian boyfriend had a big plate of scrambled eggs. Lunch: 150 baht. 11am - 1pm. We were too busy playing in the waterfall and missed out on lunch. I was given wonton soup, chicken massuman curry and chicken rolls. Vegetarian boyfriend was given tofu soup, cashew nut and vegetable stirfry and a mushroom dish. Rice was in a big bowl to share. Fresh fruit for dessert, yum. Drinks: Free water, tea and coffee at any time. Shop: You can buy stuff like toiletries and medicine at the resort. Service: Probably the best service we've ever had in Thailand. Mink is the owner, a friendly old man with great English and a really warm personality. Animals: There are quite a few animals! Not only dogs, frogs and cats but also little piglets and chickens. Stuff to do nearby: Ask Mink about Bua Tong waterfall, the bat cave and the ghost market.